The Daisy was probably made by Ives, Blackeslee of New York (later Ives Blackeslee Williams). The company dealt in novelties and was the principal distributing–and perhaps manufacturing–company for rail presses at the end of the nineteenth century. Their line included the Boss, Favorite, Daisy, Leader, and other very similar rail presses. 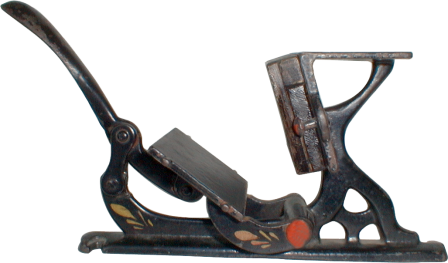 These tiny presses were usually sold in kits with ink, roller, tweezers, cards and bronze dust included. (Bronze dust was mixed with ink to give it a metallic look.) The Daisy pictured is missing its chase, which would be held in place by two protruding screws, visible in the photo.